Andrew Crowhurst, 22, of Worthing Road, Rustington, was fined £220 and must pay £30 victim surcharge, £127 costs, after being found guilty of fishing without a licence at Southern Leisure Complex, Chichester, on May 28, 2017. Oliver Pannett, 51, of Wick Parade, Wick, was fined £220 and must pay £30 victim surcharge, £127 costs, after being found guilty of fishing without a licence at Southern Leisure Complex, Chichester, on May 28, 2017. Hollie Moore, 30, of Brighton Road, East Worthing, was given a community order with Drug Rehabilitation Requirement and Rehabilitation Activity Requirement after admitting stealing meat worth £40.71 from Tesco, Tarring, on June 7, 2017; stealing coffee worth £86.52 from Tesco on June 11, 2017; stealing coffee worth £46.02 from Tesco on June 14, 2017; stealing groceries worth £9.20 from Tesco on June 18, 2017; stealing wine worth £5.94 from Tesco on June 21, 2017; and stealing DVDs worth £115.94 from HMV, Worthing, on July 6, 2017. She must pay £85 victim surcharge and £95.93 compensation to Tesco. She also admitted breaching a conditional discharge order, no action taken. Darren Taylor, 42, of Teazle Close, Petersfield, was fined £438 and must pay £43 victim surcharge, £650 costs, after admitting possessing cocaine in Surrey Street East car park, Littlehampton, on June 20, 2015. He was fined £292 and disqualified from driving for six months after being found guilty of being in charge of a vehicle while over the drink-driving limit (63mg of alcohol in 100ml of breath) in Surrey Street East car park, Littlehampton, on June 20, 2015. He was fined £50 for failing to surrender to custody at Worthing Police Station on July 21, 2015. His driving record was endorsed with ten points after admitting being in charge of a vehicle while over the drink-driving limit (86mg of alcohol in 100ml of breath) in Douro Place, Dover, on December 6, 2015. He also admitted using a vehicle at Surrey Street East car park without insurance and failing to surrender to custody at Chichester Magistrates’ Court on January 13, 2016, no separate penalties. He admitted breaching a community order by failing to attend the Building Better Relationships Programme, no action taken. Bradie Thomson, 28, of Becket Court, Rectory Road, Tarring, admitting breaching a suspended sentence order by failing to report for an RAR session on September 12, 2017, and for unpaid work and an RAR session on October 3, 2017. The suspended sentence order was varied to include an additional 20 hours’ unpaid work, making a total of 160 hours. Rachel Marchant, 31, of Winterbourne House, Rowlands Road, Worthing, was fined £40 and must pay £30 victim surcharge, £85 costs, after admitting being drunk and disorderly at Lancing Railway Station on October 7, 2017. Ricky Parrish, 35, of Grafton Road, Worthing, was discharged conditionally for 12 months and must pay £20 victim surcharge, £85 costs, after admitting possessing 7g of cannabis resin and one herbal cannabis plant in Brougham Road and Grafton Road, Worthing, on October 5, 2017. His driving record was endorsed with four points after admitting failing to co-operate with a roadside drugswipe in Worthing on October 5, 2017, no separate penalty. Bradley Porter-Wingate, 24, of True Blue Cottage, Wick, was fined £80 and must pay £30 victim surcharge, £85 costs, after admitting being drunk and disorderly at Worthing Hospital on October 6, 2017. Reece Soesman, 20, of Collard Close, Kenley, was fined £250 and must pay £30 victim surcharge, £85 costs, after admitting possessing cocaine in Shoreham on June 10, 2017. George Waring, 22, of Mersham Gardens, Goring, was given a community order and must carry out 100 hours’ unpaid work after admitting drink-driving (117mg of alcohol in 100ml of breath) in Wykeham Road, Worthing, on October 7, 2017. He must pay £85 victim surcharge, £85 costs, and was disqualified from driving for24 months. Linton Woolley, 29, of Lavinia Way, East Preston, was given a community order and must carry out 60 hours’ unpaid work after admitting three charges of drug-driving (24ug/l cocaine, 659ug/l benzoylecgonine, 4.6ug/l Delta-9-THC) in Lavinia Way, East Preston, on July 12, 2017. He must pay £85 victim surcharge, £85 costs, and was disqualified from driving for 24 months. Joanne Granger, 44, of Hillside Road, Sompting, was given a community order and must carry out 200 hours’ unpaid work after admitting stealing two iPads worth £1,900 from Whittington & Co, Worthing, on or before July 2, 2015; and stealing £1,100 cash from Elite Foods, Newhaven, on July 3, 2014. She must pay £85 victim surcharge, £85 costs, £1,100 compensation. 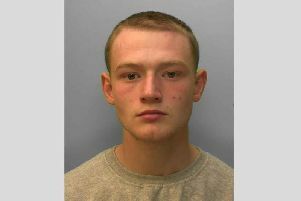 Joshua Lee, 22, of Shelley Road, Worthing, was given a 12-week prison sentence, suspended for 12 months, with three-month curfew from 8pm to 6am daily and Rehabilitation Activity Requirement after admitting harassment through unwelcome Facebook messages between August 15, 2017, and August 23, 2017. He was also given a restraining order. He was given an eight-week consecutive prison sentence, suspended for 12 months, and must pay £35 compensation after admitting stealing face cream worth £35 from Lloyds Pharmacy, Worthing, on July 8, 2017. He was given an eight-week concurrent prison sentence, suspended for 12 months, and must pay £20 compensation after admitting stealing Dove skin care worth £20 from Lloyds Pharmacy, Worthing, on July 10, 2017. He was given an eight-week concurrent prison sentence, suspended for 12 months, and must pay £40 compensation after admitting stealing Dove skin care tins worth £40 from Lloyds Pharmacy, Worthing, on August 7, 2017. He was given an eight-week concurrent prison sentence, suspended for 12 months, after admitting attempting to steal Dove skin care from Lloyds Pharmacy, Worthing, on July 10, 2017. He was a four-week consecutive prison sentence, suspended for 12 months, and must pay £150 compensation after admitting assaulting a police constable in Chapel Road, Worthing, on October 6, 2017. He also admitted being drunk and disorderly in Chapel Road, Worthing, on October 6, 2017, and resisting a police constable, no separate penalties. Marian Tomaszewski, 53, of Fetherston Road, Lancing, was given a community order with Rehabilitation Activity Requirement and msut carry out 60 hours’ unpaid work after admitting two charges of drug-driving (62ug/l MDMA, 2.5ug/l Delta-9-THC) in Manor Road, Lancing, on July 11, 2017; and driving without a licence. He must pay £85 victim surcharge, £85 costs, and was disqualified from driving for 22 months.